Crescent Dunes offers you and your guests the best in amenities for your North Myrtle Beach getaway. It is always nice to have your own kitchen when you travel with a group, and these North Myrtle Beach condos come with nicely-appointed kitchens with all the necessary appliances. The early risers in your group can start a pot of coffee, then head out to the furnished balcony to savor it as they watch the sun rising over the Atlantic Ocean. Perhaps the sight of the beautiful beach below will tempt them to throw on a bathing suit and head down for an early morning swim. Wireless Internet access is provided at Crescent Dunes, which is just about a necessity in this day and age. Whether you want to keep up with what is happening at work, your kids want to post their beach pictures on Facebook or you want to make tee times at one of the more than 100 beautiful golf courses near this North Myrtle Beach resort, having the Internet will be a blessing. There is nothing worse on vacation than having to search for a laundromat but when you stay at Crescent Dunes you will not have that hassle! Wash out those sandy beach towels and bathing suits using the convenient washing machine and clothes dryer provided in these North Myrtle Beach vacation rentals. Whether you are a beach person or a pool person, Crescent Dunes can make you happy! Located just steps from the beach and the waves of the Atlantic Ocean, this North Myrtle Beach resort is perfect if you want to spend a lot of time in the sand and surf on your North Myrtle Beach getaway. Bring your rafts and boogie boards and ride the waves, make sandcastles, play some Frisbee or look for colorful seashells to take home as souvenirs of your time in South Carolina. There are many fishing piers near Crescent Dunes where you can cast your line and try to catch your dinner. If you do not like the idea of sand between your toes—no worries! The private swimming pool at Crescent Dunes offers you a secluded spot where you can work on your tan without having to shake the sand out of your beach towel! There is also a charcoal grilling area provided at Crescent Dunes that will be the perfect spot for an evening cookout after a busy day on the beach or at the golf course. North Myrtle Beach, South Carolina is a popular vacation spot for people from all over the country, and when you reserve a Crescent Dunes vacation rental you will find out why! Just down the beach from this North Myrtle Beach resort is a plethora of restaurants, serving not just fabulous seafood but cuisine from all over the world. The thrill seekers in your group will want to visit Family Kingdom Amusement Park, MyrtleWaves Waterpark or challenge themselves to bungee jump or parasail. In addition to fabulous golf courses, North Myrtle Beach is home to go kart tracks, batting cages, putt-putt courses, zip-lines and sporting events. The shopping in North Myrtle Beach is unparalleled—whether you are a bargain shopper and want to cruise the outlet malls for deals or you are in the market for something more upscale you will have no trouble finding just what you are looking for in this area of South Carolina. Do not forget to check out The Carolina Opry or the Alabama Theatre for some of the best entertainment around. Crescent Dunes is in a great location for you to explore it all! 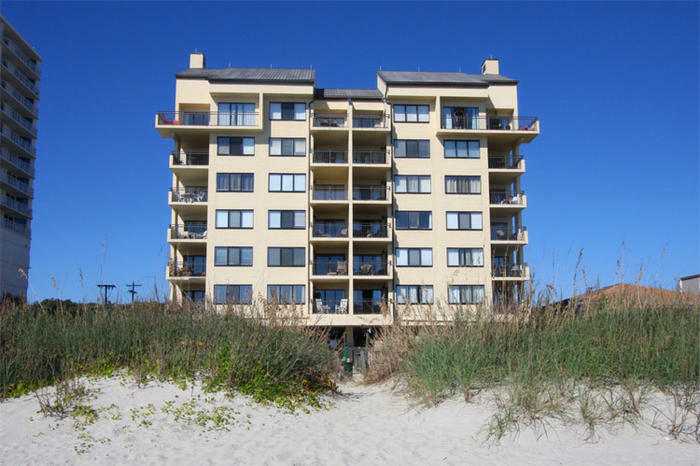 Elliott Beach Rentals is not affiliated with onsite management or the HOA of Crescent Dunes.